14 Lincoln Parkway is the middle of three homes designed by the Buffalo architecture firm of Lansing and Beierl for members of the John Bush family. This home, built in 1902, was first occupied by Myron P.. Bush, and his wife, the former Carrie Benson. A prominent banking attorney, Myron further distinguished himself by wearing winged collars long past their general fashion acceptance. 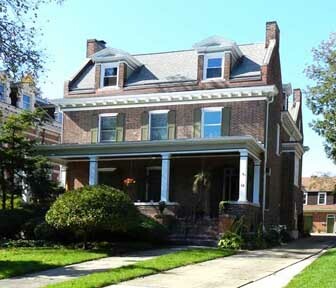 The brick of the colonial revival style home runs in a Flemish bond pattern. The public room floors sport a field of full-length hardwood boards within a perimeter of wood. The perimeter extends uninterrupted into the adjoining rooms, where the format repeats. Trim and ceiling moldings vary from room to room, with the library molding bearing the telltale “ears” of a Lansing design. Although updated with modern cabinetry, the kitchen boasts an original built-in bread oven. Bread would bake just from the heat streaming through the chimney nearby. Special thanks to owners Mollie and Jerry Verdi for their cooperation in 2011.